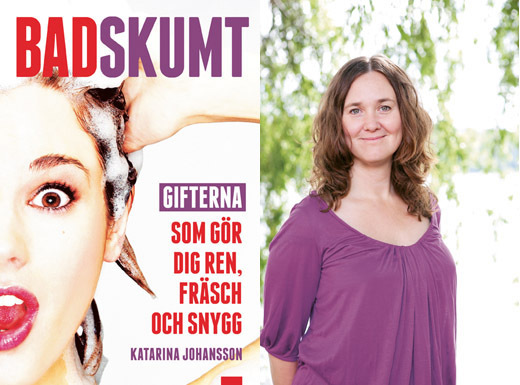 A few weeks ago we met the author; Katarina Johansson, at Spadagarna, and we got inspired to find out more about her book “Badskumt”. In our everyday life we use so many products that are filled with environmental hazardous and damaging substances. We apply products to our skin that contain ingredients that are known for causing allergies. We use perfumes that can affect the hormonal system and we use sunscreen that can hurt our DNA. Isn’t this crazy? Or are we making too much fuzz about this? What do you think? Feel free to share your view on this matter in the comments field below. Even though not all chemicals are dangerous we still know very little about the cocktail effect; What happens when we mix hundreds of chemicals every day on our skin? And this is where Katarina’s expertise comes in. What is your background? Katarina: I used to work for the National Swedish TV, and I used to do a lot of documentary films. But I have also always had a great interest for environmental issues and I have studied environmental journalism. What made you write the book? Katarina: I think it all started when I was studying Environmental Science at university and we had a marine biologist visiting, who really inspired me to learn more about all the chemicals we apply on the skin and what it does for us and for the nature. I wanted to learn more, but could not really find a lot of material or information on this subject. I read the book “Hemliga kocken*” (a book about all the “hidden ingredients” in the food and what our processed food actually contains) and that is when I got the idea to my book; Badskumt. I wanted to compile information and write an informative book about what our cosmetics contain and what the ingredients actually do for us and for the nature. Were there any difficulties while researching and writing the book and how long did it take? Katarina: It took me 2 years to finish the book, from start to print. While doing the research I felt that there is a lot of information that is missing out there. Also the information about hazardous ingredients in the cosmetic industry can be interpreted in many different ways. Different countries also have different guidelines and recommendations and limitations to how to use and handle all the chemicals. While researching, did you see any differences among countries? Could you see any countries that stand out more when it comes to cosmetics and concern about the environment? Katarina: I would say Denmark appears a lot in these discussions, and they are also more cautious in their recommendations and advice regarding the use of chemical ingredients in beauty products. In Denmark there is also a greater concern about avoiding certain chemicals in cosmetics during pregnancy. What area do you think is the most important to be cautious about? Katarina: My main suggestion would be to be careful with hair coloring, which contains a lot of chemicals. But also to generally cut down on the number of products in your bathroom. Even though not all the chemicals in your cosmetic products are hazardous for you or for the environment we know very little about the effect when hundreds of them are mixed together. I have also started to use solid hand soap instead of liquid hand soap, as there is no need for preservatives in a solid had soap. Unfortunately this book is so far only published in Swedish, but if you would like to get in touch with the author, you can find a “Badskumt” – profile on Facebook. ← Thinking of creating your own products? Think twice!